(APN) ATLANTA — The Georgia Legislature has approved a November 2016 voter referendum on a new City of Stonecrest in Dekalb County, while it did not approve a proposed referendum on a new City of Greenhaven, that also would have occurred in DeKalb County. SB 208, the proposed City of Stonecrest, was sponsored by now-former State Sen. Ronald Ramsey, Sr. (D-Lithonia) in the Senate and now-former State Rep. Dee Dawkins-Haigler (D-Lithonia) in the House. SB 208 had already passed the State Senate in the first year of the current Legislative Session, on March 25, 2015, with 45 yea votes and one nay vote. It passed out of House Government Affairs Committee on February 16, 2016, but had stalled up until the last few weeks of the Session. On March 02, 2016, it was withdrawn and recommitted to Committee with changes. It passed Committee a second time on March 10, 2016. “They revised the charter for the mayor position to be part-time. They changed the salary from 75,000 to 20,000. The city council salaries were changed from 25,000 to 16,000,” according to Ed Williams of Citizens Against Cityhood in DeKalb. On March 16, 2016, it passed the House by substitute, and on the last day of the session, SB 208 passed the Senate with a vote of 39 to twelve. Opposing Stonecrest in the Senate were State Sens. Gloria Butler (D-Stone Mountain), Bill Cowsert (R-Athens), Mike Crane (R-Newnan), Vincent Fort (D-Atlanta), Gail Davenport (D-Atlanta), Steve Gooch (R-Dahlonega), Steve Henson (D-Tucker), Josh McKoon (R-Columbus), Nan Orrock (D-Atlanta), Elena Parent (D-Decatur), Valencia Seay (D-Riverdale), and Horacena Tate (D-Atlanta). 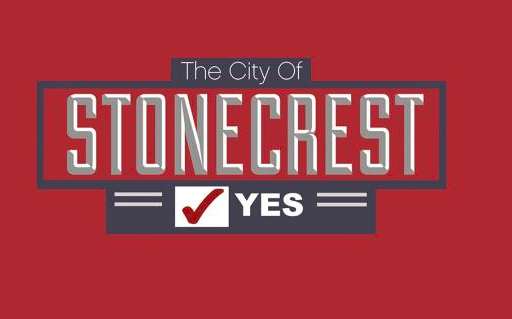 The proposed City of Stonecrest would provide three government services: parks and recreation, code enforcement, and planning and zoning. 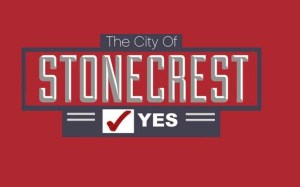 If approved by voters in a referendum, the City of Stonecrest boundary lines will include the southeastern corner of DeKalb County, including Stonecrest Mall, running next to the City of Lithonia boundary line and stretching above 1/20 interstate highway at one point. It would have about 50,000 residents. There is no historic area of Stonecrest; basically just a mall, and a struggling one at that. Notwithstanding the mall, Stonecrest is as much as a historic area as LaVista Hills. SB 221, the proposed City of Greenhaven, sponsored by now-former State Sen. Ronald Ramsey, Sr. (D-Lithonia), failed to be approved by both the State House and Senate this Legislative Session. A House version, HB 613, had been sponsored by State Rep. Pam Stephenson (D-Decatur). On March 26, 2015, SB 221 passed the Senate with a vote of 37 yeas, eleven nays; it was then tabled. On January 11, 2016, it was taken from the Table in the Senate, and recommitted to Committee. It came out of Senate Committee again on March 07, 2016. On March 07, 2016, it passed the Senate again with a vote of 37 to thirteen. Opposing Greenhaven in the Senate were many of the same Senators who opposed Stonecrest: Butler, Davenport, Henson, Parent, Tate, and Thompson. Additionally, voting nay were Lester Jackson (D-Savannah), Donzella James (D-Atlanta), Harold Jones (D-Augusta), Emanuel Jones (Decatur), Fran Millar (R-Dunwoody), Michael Rhett (D-Marietta), and Freddie Powell Sims (D-Dawson). Interestingly, Sens. Jones and Parent, who were both co-sponsors of SB 221 with Sen. Ramsey, voted against their own bill in the end. And even Sen. Millar–whose never seen a city he could not support–voted nay. It was assigned to the House Governmental Affairs Committee where it never received a hearing. The many twists and turns of Greenhaven often left proponents and opponents of SB 221/HB 613 scrambling in those last few days to find a meeting that was changed or cancelled. There were rumors that Greenhaven might be added to the Committee agenda at the last minute–as South Fulton was–but that did not occur. There are problems with Greenhaven that prevented it from becoming a new city. The most problematic was that it would encircle several existing cities preventing them from any future growth or annexations. Mayors and citizens from Clarkston, Stone Mountain, and Pine Lake maintained a presence at the Capitol to protect their cities from becoming landlocked by Greenhaven boundary lines. It would have become the second largest city in Georgia with 300,000 residents, encompassing over forty percent of DeKalb County. Greenhaven would haved provide three services: parks and recreation, planning and zoning, and code enforcement. It would have continued to rely on DeKalb County for all the other services, including police. Many legislators felt it was not ready to be a city.